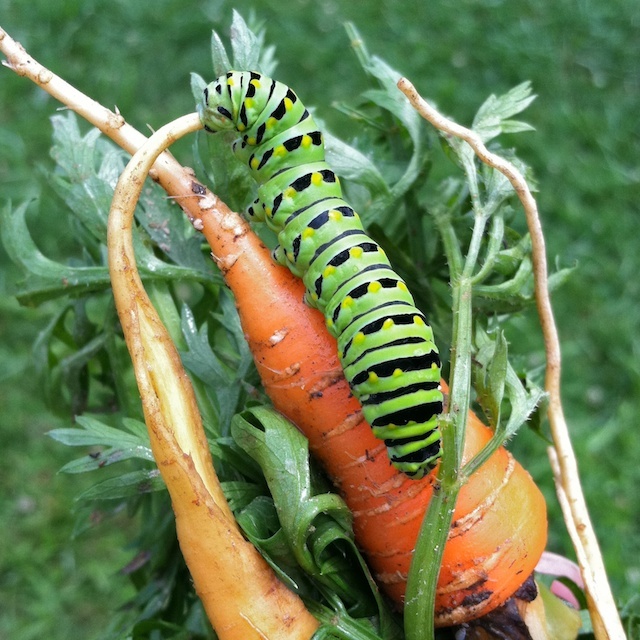 Lookee who I found in my carrot patch yesterday… a beautiful eastern black swallowtail caterpillar (Papilio polyxenes). At first, my attractive little visitor was mad at me and flashed a bright orange osmeterium. Looking like soft orange antlers, the forked osmeterium organ emits a liquid compound containing chemicals called terpines. 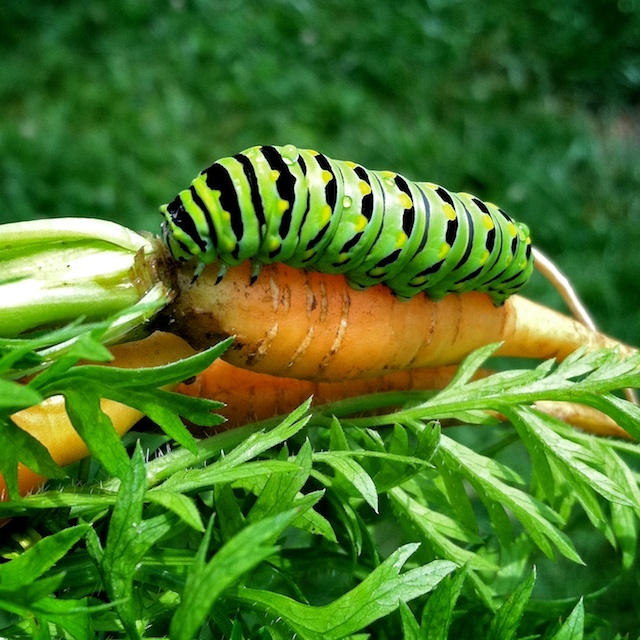 Unfortunately, I missed the photo of the brightly colored, antler-like osmeterium when it was visible… it looked sensational against the bright green foliage and orange carrot roots. Regardless of my missed opportunity, as the sun played hide and seek above, I took a few more photos in the changing light before releasing my visitor. Yet, without a maco lens and precise focusing abilities, my iPhone camera and I found this creature to be the most persnickity of portrait subjects. The little animal’s front end was in constant motion and I could not get a well-focused shot – let alone get any sort of smile – or even a wink! Mother Sun bleached out the appearance of these vibrant colors in my photos. However, I can see the bright and contrasting colors applied to interior decorating projects… Easily, I can envision this palette in a kid’s room or kitchen. Pop in some hot pink or purple for a bit of whimsy. Against an expanse of white, I see a very chic and modern living space. After finding an expired mama eastern black swallowtail butterfly during one of my walks recently, it is heartwarming to see her life was not in vain. The life cycle continues! 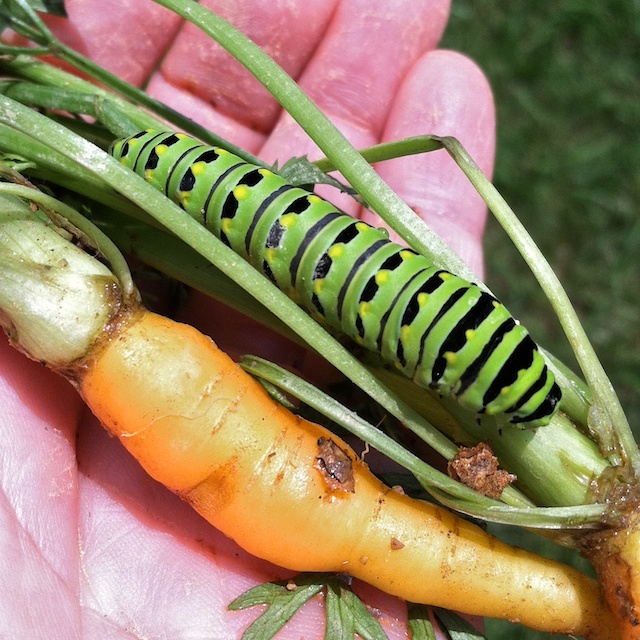 Without the short black spikes that appear around the black stripes of younger caterpillars, the creature in my carrot patch looks about ready to pupate. 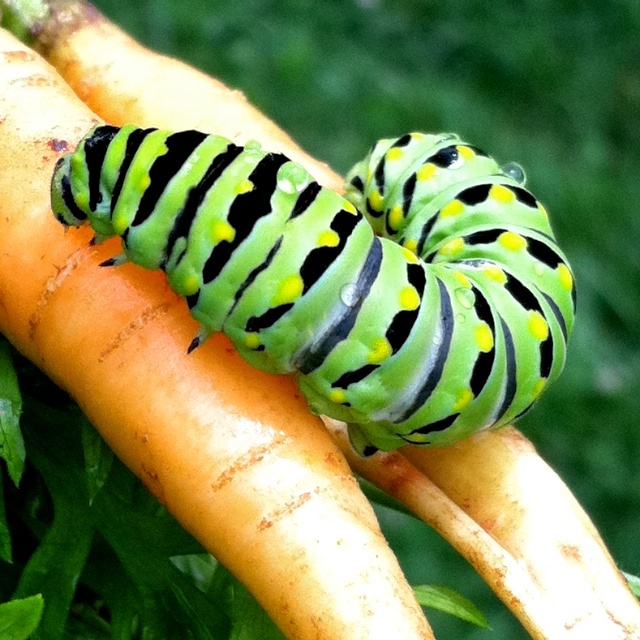 After just two weeks in its chrysalis stage, I look forward to seeing this little beauty spread its wings as a majestic swallowtail butterfly.